If making enchiladas you will also need Red Enchilada Sauce (recipe below), shredded cheese (cheddar or Monterey Jack or colbyjack), and anything else you like to put in or on enchiladas (lettuce, avacado, black olives). Saute onion in 3 Tbls oil in large pan. Add chicken and saute. Add remaining ingredients except tortillas. Cook over low-medium heat until everything is combined nicely and most of the liquid has evaporated. 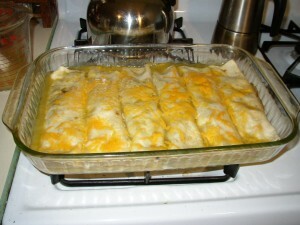 (If you are going to be frying flautas you will want the filling nearly dry. For enchiladas or burritos you can leave it more moist.) Remove from heat. Soften tortillas by (1) warming briefly, 30 seconds a side, in a dry, hot frying pan or (2) dipping briefly, 5-10 seconds, in hot frying oil or (3) wrapping in foil and placing in a warm oven for 10-15 minutes or (4) wrapping in damp paper towels and heating in the microwave on high for 60 seconds. Everyone has their thoughts/preferences on the best way to soften tortillas. The purpose is to make them easier to roll without breaking or tearing. If they are REALLY fresh, you may be able to skip this step altogether. For flautas: Roll heaping Tbls. of chicken into each softened tortilla. Close with toothpick. Fry 2 at a time in hot oil for approximately 90 seconds (or until lightly golden brown). Drain on paper towels. Enjoy! I love these dipped in Chile con Queso (gringo/cheaters recipe below), but salsa and sour cream would work as well. For enchiladas: Preheat oven to 350°F. 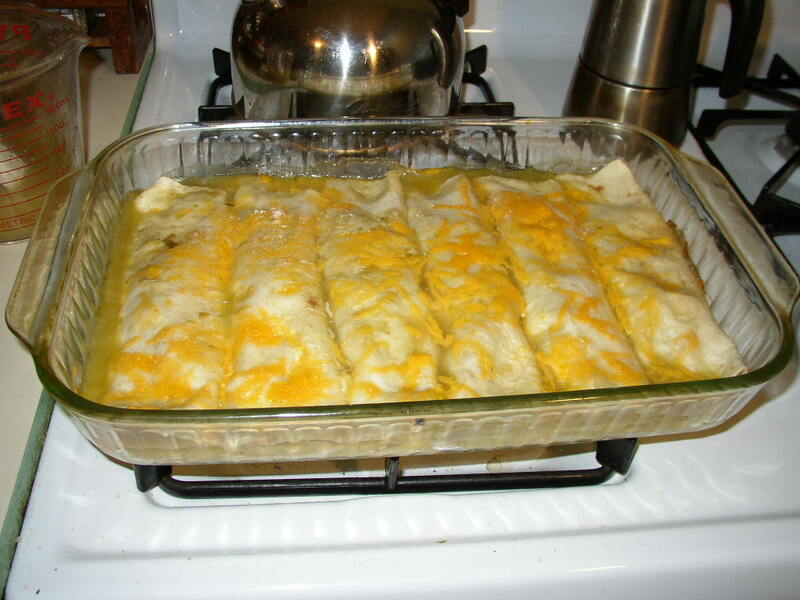 Place a thin layer of red enchilada sauce in the bottom of a 9×13″ baking dish. Spoon 1-2 heaping Tbls. of filling onto a torilla. Add cheese (if desired). Roll and place seam side down in baking dish. Continue with remaining filling and tortillas. Once they are all in the baking dish, pour some red enchilada sauce over them (how much depends on how dry/wet you like them). Sprinkle with shredded cheese. Cover the dish with foil. Bake for 30 minutes. Remove foil and bake a few minutes more until cheese is nicely melted. Serve with rice and beans if desired. Over medium heat in a medium saucepan, blend 2 Tbls shortening with 2 Tbls flour. Add 1/4 to 1/2 cup chili powder until oil is absorbed. Slowly add 2 cups liquid (water or broth or tomato juice or tomato sauce or a combination). Salt to taste. Simmer 20 minutes. See note below about chili powder vs. ground chili peppers. Yes, the secret ingredient for an easy creamy chile con queso is Velveeta. It really does make a wonderful cheese sauce . . . You can try this with “real” cheese, but you will need to be very careful about keeping it at just the right temperature so that the oil doesn’t separate out from the cheese curds . . .
Saute onion in butter until tender. Add flour, gradually, stirring constantly. Cook for 2-3 minutes over med-low heat. Gradually add 2 cups of the milk, about 1/2 cup at a time, continue stirring. You should end up with a thick, creamy white sauce (see note). Add chiles and jalapeños and simmer over low heat for 5-10 minutes. Add cheese, stir until melted. Add remaining milk if needed for thinning. Note: the cheese will thin the sauce so be sure the white sauce is thicker than desired for dip and reserve some of the milk so you can adjust at the end. Chicken: I usually make this filling with chicken or turkey left over from a roasted bird. If you haven’t roasted a chicken lately, no worries. You can use 4 small cans of chicken meat (sold near the cans of tuna) or 3-4 chicken breasts (or other pieces) salted and poached in water or broth. I suppose you could also dice raw chicken and just increase the time on the saute in the recipe above. Just make sure the chicken is cooked before adding the other ingredients. Tortillas: I prefer flour tortillas, though I think corn are more traditional for flautas and enchiladas. If you are making flautas you will need tortillas small enough to fit in your fryer (I have a small fry daddy, so I use the small. 6-8″ flour tortillas for flautas, but larger ones for enchiladas and burritos). The chicken filling recipe is great and versatile as is (the way it was taught to me), but could probably use some additional spices: cumin, corriander, chili powder. Start with 1/2 tsp. of each and see what you think. Chili Powder is NOT the same as Ground Chili Peppers. Chili powder contains ground chili peppers PLUS spices like cumin, garlic and Mexican oregano. If you use plain ground chili peppers for the Red Enchilada Sauce, you will probably want to spice it up with some spices. For a discussion of “chile” vs “chili” see http://itsfiveoclocksomewhere.blogspot.com/2007/08/chile-vs-chili.html; I’m not very good at using them consistently . . .